Some of you will know me as the silent co driver from AWS Racing (John). 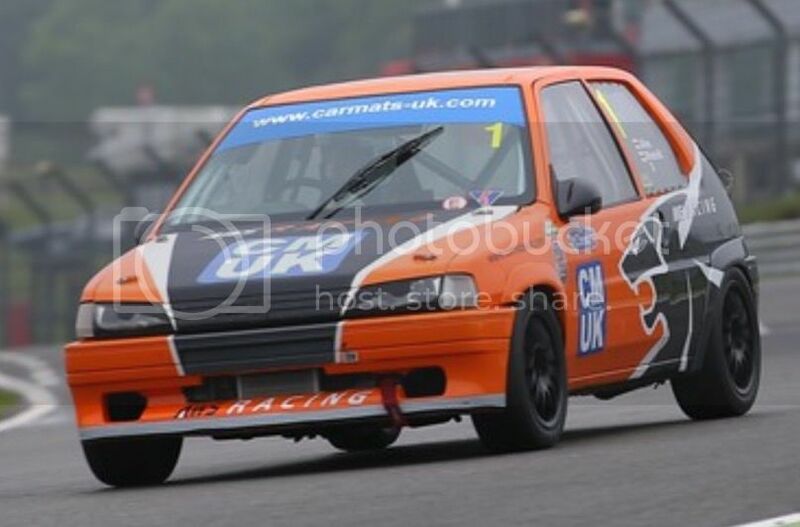 If you know AWS Racing you will know that the 2016 season has not gone according to plan, our 16v race car never made it to completion & our old series 1 known as Tigger met its maker in a startline crash at Brands in June..
Andrew and I have parted ways, he has gone to the dark side with a Civic Cup car, and I have been sprinting my 205 whilst on the lookout for a 106 shell to convert to a race car. I found a suitable specimen locally with a cage, part stripped and being used as a track day car. I will try to upload pics of the above as soon as I figure out how. Any way just wanted to say hi. If anyone is interested I will try to do a build thread for the 2017 season car. 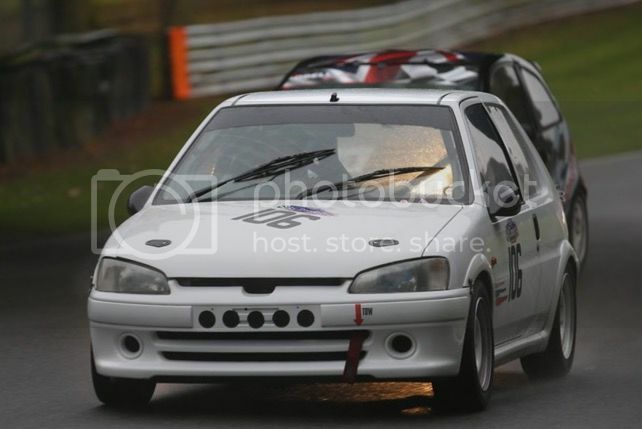 Taken at Oulton Park t the final round of the CSCC Tin Tops series.. The Bianca White Rallye in the last picture is up for sale as I have acquired a new shell with a full weld in cage and a few other trick bits already attached. 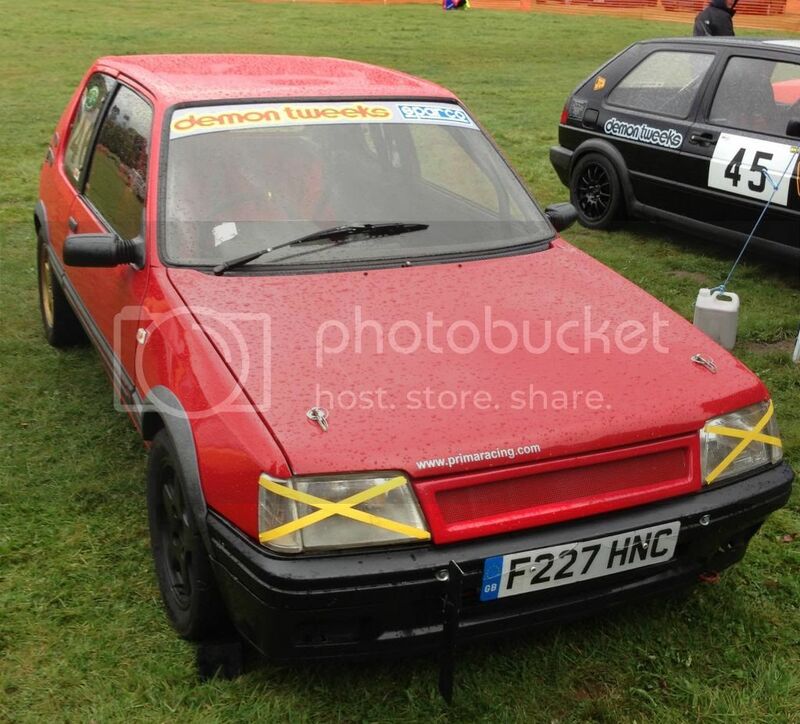 If anyone is interested in or knows anyone interested in buying the Rallye or my Sprint/hillclimb 205 please feel free to message me..
Full update in the new year. White Rallye sold to a local chap who is threatening to come and play with Tin Tops later in the year. Our car is complete and first test threw up a load of issues. Time and funds have until now prevented any progress.. I will be spending the weekend on the car and will take some fresh pics and do a full update soon.. I know it's long overdue, bendee inspired me to take 5 mins..
Haha glad I have gave some inspiration. I think we've met before? I've had some ledas and a048s on rallye steelies off of you? Well it all seems like a bluer... one minute we were loading up for the trip out to Spa the next I'm back home looking at the photos. So here goes.. Thursday morning 7.40am ferry to Calais on time! Making good time in France then, Belgium traffic OMG.. it's been a few years and I forgot how bad it was. We eventually arrived at Spa with 1 hour until the last test slot, quickly unloaded the car, noise test, sign on, pay money, suit up and off up the hill from O'rouge.. Dragged back to the pits, we think the fuel pump has overheated (eBay special), a quick round of the paddock and a new Bosch pump was borrowed, fitted and tested. Friday morning dawned another hot day, scrutineered the car FIA rules ��, all ok and passed. Our qualy was late afternoon, got to the collection area - dead battery - bump started it ok and rushed out of the paddock and up the hill again from 0'rouge, again 3/4 lap and it started to splutter. Straight into the pits as it was only running on 2 cylinders. Re set the ecu, bumped it again and set of. I got out of the pits and onto the downhill into o,rouge and it started to die.... literally just made it to the top and found a pull off and that was my qualifying over. Back in the paddock and a quick test revealed a dead alternator (probably the reason for the fuel pump not working the day before also). Again a quick search of the paddock and a very nice mr Williams with his saxo lent me his spare (brand new) alternator. Fitted and tested in anticipation of being able to race on Saturday..
After a quick grovel to the powers that be in race control I was aloud to start at the back of the grid. Well Saturday arrived and I was so nervous I felt quite ill. I think the last 2 days had taken its toll. Anyway, after a good talking too by my team I got in the car and set off for the rolling start. There were 60+ cars on the grid, I'm pretty sure that by the time I got to the pit straight the leaders were already looking to lap me. Lap 1 complete no issues, lap2 compleated no issues, I managed poss 5 laps at near on full race pace before my tyres cried enough and turned to some kind of jelly.. i also miss calculated fuel levels and had to short shift in order to finish.. and finish I did, yea haaaaaa.. 49th overall and 3rd in class I'll take that anyday..
Sunday dawned and it was raining. We had put our spare wheels with some just in case 5 year old tyres on the car, medium on the front and god forbid hard on the rear... it's all we had ok.. Filled the tank to the brim this time not taking any chances, good charge from the alternator and some tyres on ready to go. I was a bit further up the grid this time but still had no clue when the lights went green, so I went when everyone else did. We were having a good race with our class leader until pit stops, then after the stop a safety car as people were throwing themselves at the aramco (not advised). Had a good re start dodging all the front runners until about 3/4 lap width 8-10 mins to run the red flags came out game over. There was a big crash between a Porsche & an M3. Both cars were a mess, both drivers a bit knocked about but glad to report all home safe. So that was it all over!!! Had an absolute blast, one of the best places I've ever raced at and am now trying to save up and go aging may be in a couple of years. Finished the second race 40th overall and 2nd in class. I will work out how to upload pictures again soon, but for now thanks for your interest and I will be back when there is more to tell. We are there in October, where did you stay? We stayed at a place called Val d'Arimont Resort just outside Malmedy. Hoping to do Oulton again at the end of the season, might we see you there? Thank you, I'll look it up now. I'd say there is a pretty good chance! Lisa & Toby usually ask me to do their pit stops.